If I wanted to make this the shortest review in Working for the Mandroid history I would just say: Kristen Simmons had some big ideas that she couldn’t execute in an interesting, thought-provoking or compelling way, so the whole story reads a bit like fable that has a hard time getting to the point. But I guess I should go into it a little more. The Glass Arrow is okay with okay characters and a nothing special plot that’s trying to be a feminist text for a budding feminist, but instead it can’t decide whether to remain subtly political so that it doesn’t get in the way of the action or put the feminism issues front in center. The entire novel becomes a stuttering narrative with a somewhat bland protagonist that just left me bored more often than not. A love interest is shoehorned in, plot conveniences are relied on and highly telegraphed and the resolution of the novel is small. I don’t know if this is the beginning of a series that plans to explore larger issues in the extreme patriarchal society Simmons's has created, but The Glass Arrow doesn’t dive enough into the societal issues to become much of a feminist story. It definitely didn’t have the realism aspect of a novel like The Handmaid’s Tale, which was realistic enough to make me fearful of the potential realities reflected in that book. Instead The Glass Arrow reads like a half-developed idea that could have used some more brainstorming before it was plotted out. Meanwhile Eric Walters will keep giving me nightmare fuel by feeding into my negativity. It’s not a very healthy relationship we have here, Eric, and yet I enjoy it all the same. Francesca Lia Block and I have a history. She wouldn’t know me if I walked up to her and poked her in the arm, but I have an irrational feeling like I know her. I clung to her Weetzie Bat books as a teenager, going back to them over and over again. They were unlike anything I had ever experienced and none of my friends knew who she was. It was like she was my secret friend, who understood my misfit-ness and could wrap me up in techno-color dreams on the darkest of days. It’s been a decade since I last picked up one of Block’s books, and I’m no longer in that bleak state of teenagerdom, so I wasn’t sure how Block’s latest series would work for me. I’m a little ashamed that I doubted my secret friend because reading Love in the Time of Global Warming was like coming home after being gone for far too long. It is the same trippy gorgeous weirdness of her previous books wrapped around a solid plot and a leading lady that finds all this hidden strength deep inside of her when the world literally falls apart around her. I’m tempted to leave my review just like that, but I won’t because that could be a really good “You guys!” or a not so great “You guys!” In this case it’s the good kind. If there is one thing in this world that I love more than books, it’s food, so I was severely uncomfortable yet morbidly fascinated by the concept of Swain’s Hungry from the first pages. Then midway through the book took a sharp turn and drove right into creeptown only to progressively get creepier as the book reached its final pages. I don’t know what subject matter Swain has covered in the past, but this book freaked me out. Thalia lives in a very materialistic world where no one has to eat food because inoculations and a scientifically perfected liquid have negated hunger after a devastating war that resulted in famine and starvation a generation before her. She lives in a world full of flashy tech distractions that fuel a massive society of consumerism that somehow Thalia has avoided buying in, preferring the vintage clothing from her grandmother’s younger days and hacking into the corporate overlord’s games to try to prove a point. Then one day she wakes up with an ache deep inside of her, one that causes her abdomen to make crazy noises and causes her scientist mother real concern. She has started feeling hungry in a world where there is no food. This hunger leads her to cross paths with Basil, a boy from outside the walls that surround her privileged life in the inner city. He is from the slums that Thalia didn’t even realized existed, where he has to fight for each bottle of liquid nutrition just to survive as he dreams of a world where food isn’t forbidden. Conveniently he has also started feeling hunger and with the hunger comes to building unruly hormones of being a teenager. The first half of the book focuses on the world building as Thalia discovers how small of a world she’d grown up with and how corrupt the corporation that rules the country truly is. She finds a slew of people forced to live in poverty outside the dayglow world of her immersive games and interactive advertisements. Midway the book makes a drastic change in both scenery and tone, almost becoming a different book all together. This half is full of creepy conspiracy and general crazy floating through the air like oxygen. It is disturbing and uncomfortable and yet Swain manages to write about these twisted ideas in a way that grabbed me and refused to let me put the book down. Thalia is a naïve teenage girl that grew up in a bubble of privilege, so she is an easy proxy for the reader in discovering the world without it seeming like one exposition dump after another. As the illusion of the world around her begins to crumble, she grows distinctively until she starts questioning authority figures and refusing to take things at face value. That sort of smart character growth is my favorite and Swain writes the transition naturally without anything feeling forced or out of character. I have no idea if this is a standalone. There is a door cracked open at the end that could lead to an action-packed second volume, but then again, everything is wrapped up enough to satisfy the particular story Swain was telling. 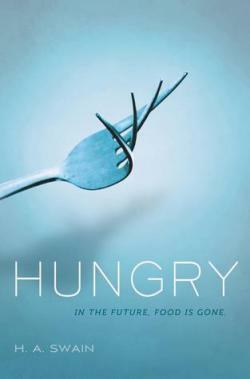 Hungry is an out-of-the-ordinary that challenged my own expectations while maintaining a solid pacing full of action and danger in a world that is both horrifying to a foodie like me and uncomfortably realistic. I have a feeling this one will hang out under the radar, but it reallydeserves more attention. I received an advanced copy of this book from the publisher. In turn I'm providing my honest review. I am so excited to have Jay Posey stopping by WFTM again, this time in support of his new release Morningstar Falls. This is the second book in his Legends of the Duskwalker series, which started with the fantabulous Three (one of my favorite reads for 2013). Today he stops by to discuss telling his story from the point of view of a different main character than in Three. Also as a note, Morningstar Falls is on presale on Amazon right now for just $5! Take it away, Jay! My latest book Morningside Fall is the second novel in a trilogy, and it picks up a little over a year after the first book (titled Three) ends. Perhaps a little unusually, the main character of the second book isn’t the same as the first. The main characters of Morningside Fall are Cass and Wren, mother and son, and though they’re both returning characters from Three, neither of them were the primary point-of-view for the first book. Having a different lead character (or two) for the second book brought its own pros and cons; some creative advantages along with some interesting challenges. First, the pros. Probably unsurprisingly, using different leads gave me the opportunity as a writer to explore the world through different eyes and to experience everything from perspectives I hadn’t necessarily spent a lot of time with in the first novel. I was in Wren’s head especially a lot more in the sequel, and it was good for me creatively to see what life was like for him both internally and externally. It also gave me the opportunity to give readers more insight into these characters than they would have gotten otherwise. Using different characters also gave me a new palette of challenges, obstacles, and threats to work with over the course of the story. It opened up a lot of interesting possibilities for me, knowing that things that wouldn’t have been much of an issue for Three (the main character of the first novel) could be a matter of life and death for young Wren, for example. New challenges forced me to find new solutions and took me in directions I probably wouldn’t have explored otherwise. Finally, I wanted Morningside Fall to be its own story, not just a rehash of the one I’d told in the first book, and adopting new main characters let me experiment with a different tone and theme. It forced me to think about everything from a different perspective, rather than falling back on things I knew had worked before. It was scary and frustrating at times, but it was good to challenge myself, to test my own limits, and hopefully to grow as a writer through the process. Which obviously means it wasn’t all smooth sailing, and there were definitely some downsides. I wasn’t nearly as comfortable with Cass and Wren as I had been writing Three. Three was a character I felt I’d known for a long time, and as strange as it may sound, I trusted him enough to know that he’d be able to adapt and overcome whatever I threw at him. Cass and Wren are both strong characters in their own right, but I didn’t have the same confidence in myself when it came to writing them, and at times I struggled with not being sure whether I was pulling punches or not. It’s a weird experience to feel like your characters are better people than you might be able to convey. That really slowed me down more than I had been expecting. And the big thing: I had no idea how The Audience was going to react to the transition. I spent a lot of time fretting over that with the second book; a debut novel is a nerve-wracking experience all its own, but at least with the first book I didn’t feel the pressure of Expectation hovering over me. With the sequel, I knew there would be people out there waiting to see where I took things next, and the fear of disappointing them was pretty strong. I probably let it get into my head more than I should have, especially since there was no way for me to know how people would react until I actually wrote the thing and got it out there for them to read. Ultimately, I’m pleased with the story I was able to tell with Morningside Fall, and even though it was a significant challenge for me, I’m glad that I pushed through with my original intent to focus on the characters that I did. I hope my readers feel the same way. Thanks for stopping by, Jay! I highly recommend that you guys all read these books because they are fantastic. Here's a bit more about Morningstar Falls. Just a reminder, there are MASSIVE SPOILERS for Three in the description. Welcome back to Trailer Park Friday, the irregular feature here at Working for the Mandroid where I post a bunch of videos that have caught my eye. Some of them are trailers, some are clips from shows, some are animated shorts that are just awesome. This is the 75th anniversary of the very first Batman comic, so DC is doing tons of Batman things this year. They recently had Bruce Timm, one of the guys behind the early 90s Batman: The Animated Series, create a two minute short in a similar style. Yay Batman! Fernando is responsible for this next one. It's a Game of Thrones parody version of "Let It Go" from Frozen. Please note that there EPIC SPOILERS through the end of this last episode that aired last Saturday. Watch at your own risk. When we went to see Captain America: The Winter Soldier (which is brilliantly awesome, by the way), there were a couple of cool trailers. One of them was a movie I'd heard about, but didn't really know much about. This is Lucy and I hope it's as surprising and badass as the trailer makes it seem. The film comes out August 8. This is the trailer for another book that I probably won't ever read because it's just going to make me horribly despressed. This is Chloe Moritz in If I Go, which comes out August 22. Tom Peretta's The Leftovers is a book I've heard quite a lot of vague praise towards, so toss in Damon Lindeloft (one of the crazy guys behind Lost) as a producer and this is a new HBO series that I'm interested in despite this trailer being vague. The Leftovers starts on HBO on August 30. And finally the trailer that I was scared to watch. The Giver is one of the books that turned me into an obsessive book reader and it's one of those touchstones that I have watch too much nostalgia towards. Despite not being in black and white, the trailer looks like maybe they didn't screw this adaptation up completely. The Giver comes out on August 15. And that's all from me this week. Hopefully we'll return next week with more trailers and videos. In the meantime, what videos have caught your interest recently? Post link in the comments!